Animal Feed Protein Ingredients Market size was over USD 125 billion in 2017 and industry expects consumption of above 400 million tons by 2024. Rising investments in agribusinesses supported by government initiatives to encourage agricultural business to combat increasing food demand will drive animal feed protein ingredients market size. Shift in dietary preferences towards high protein intake has promoted demand for meat & processed meat products may have positive influence on product demand. Asia Pacific poultry meat consumption was over 35 million tons tons in 2016 and which accounted for over 65% of the total market share. Rise in medical conditions like malnutrition among children mainly in India and China may boost animal feed protein ingredients demand. Animal feed protein ingredients helps in enhancing protein content in meat and improves quality. It ensures high growth, production performance and feed efficiency mainly in fish, poultry and livestock. Decreasing cultural and traditional barriers supported by growing fast food chains and QSR’s has resulted in high meat consumption, thereby stimulating industry growth. Growth in fish meal production mainly in Peru owing to adoption of fish farming to ensure continuous supply of fish for fish meal production will propel industry growth. Fish meal incorporation in animal feed to balance nutrient content and meet specific amino acid requirements for growth, reproduction along with reducing feed cost may positively favour animal feed protein ingredients industry growth. Strong regulatory amendments pertaining to use of animal rendered proteins as feed additive supported by labelling standards for incorporating animal protein and genetically modified plant protein may hamper industry profitability. Additional labelling and compliance requirements may incur compliance cost affecting animal feed protein ingredients market price trends. Restrictions on fishing resulting in limited supply of fishes for fish meal production thereby acting as another restraining factor. Soy meal market size from poultry is poised to surpass 155 million tons by 2024. High protein and energy content with balance of digestible amino acids and cost effectiveness has promoted use of soybean meal in poultry production. It acts as a vegetative source of highly digestible protein. 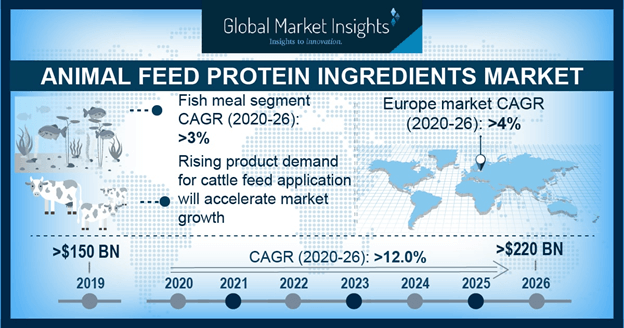 Stringent regulatory norms regarding animal rendered protein accompanied by rise in livestock diseases due to high changes of contamination of rendered protein will have positive effect on animal feed protein ingredients market growth. Fish meal market size is anticipated to exceed USD 10.5 billion up to 2024. Financial assistance supported by technology innovations in fish farming leading to growth in fish farming trends for human and animal nutrition which may fuel animal feed proteins demand. Over 60% of the global fish meal produced is used in aquaculture (farming shrimps and finfish) intensified business mainly in China should increase demand for fish meal, thereby stimulating animal feed protein ingredients industry growth. Canola meal for swine may account up to 4% up to 2024. Weaning pigs are sensitive towards nutrients imbalances, low energy and protein content in the body. Canola meal act as key and complementary source of protein supplement along with offering cost benefits. Moreover, initiatives from canola meal manufacturers to improve quality and yield with high crude protein will fuel animal feed protein ingredients demand. Bone & meat meal market size may witness significant gains owing to its importance in improving amino acid profile in animal nutrition. Manufacturers are adopting high quality standards along with laboratory analysis of the incoming ingredients for nutrition content and contamination may stimulate animal feed protein ingredients demand. Animal feed protein ingredients market size from poultry may reach up to 5.5% in terms of growth over the foreseeable timeframe. Protein ingredients plays a key role in immune function, survival rate, improving feed utilization efficiency and survival rate along with reducing rearing time. Growth in development of economical feed solutions will positively favor industry growth. Animal feed protein ingredients market size from aquaculture application may surpass USD 10 billion by 2024. Purity and clarity of the products supported by development of varied options with desired effects may positively impact product demand. Growth in aquaculture industry along with rise in fish consumption will drive industry growth. 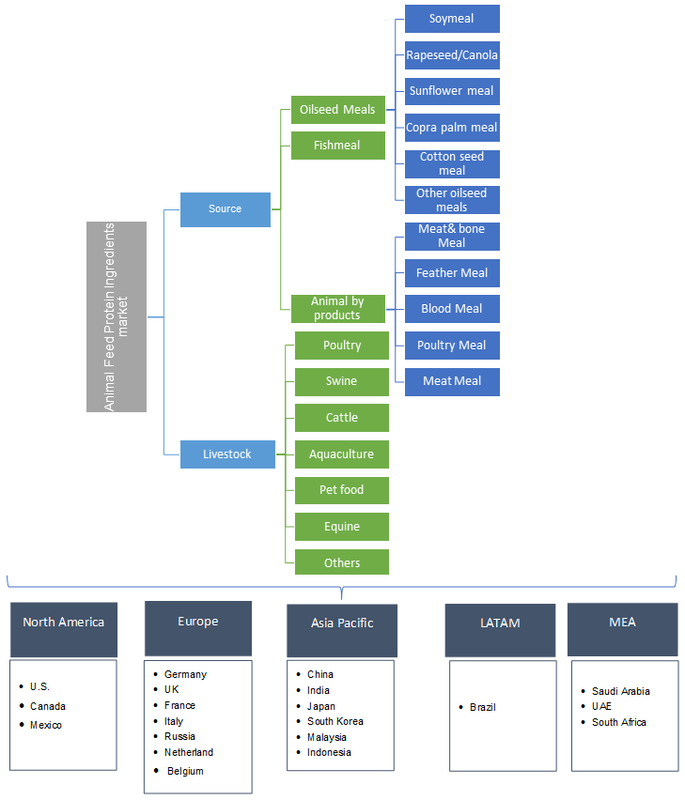 Asia Pacific driven by India, South Korea Japan and China animal feed protein ingredients market is estimated to exceed USD 95 billion over forecasted timeframe owing to increase in consumption of dietary proteins. Growing livestock disease has led to development of feed standardization policies which permits use of high quality feed additives to increase growth performance, weight gain and protein content along with high yield in animals will favor regional industry growth. Expansion in aquaculture industry owing to rise in fish consumption will contribute towards industry growth in this region. Brazil animal feed protein ingredients market may witness strong gains due to increase in livestock and feed production may drive regional product demand. High investments in agriculture business supported by balanced income distribution will have positive impact on product market size. Global animal feed protein ingredients market share is consolidated and competitive along with major players including Alltech, Dupont, ADM, CHS, Burcon NutriSciences, Hamlet Proteins, Calysta, Koninklijke DSM, Titan biotech, Nutraferma LLC, and Proliver. Other industry participants CropEnergies, A Constantino, GRF ingredients, Evershining ingredients Company, Imcopa Food Ingredients B.V, Sojaprotein and Green Labs LLC. Companies present in animal feed proteins are driven by technological and product innovations where the manufacturers are developing novel products which focuses on feed safety and supplying optimum protein quantity in feed to avoid overdose with balancing desired effect. Animal feed proteins acts as essential part of animal diet to improve body weight, maintaining appropriate body temperature, increasing yield, reproduction and development of bone structure in young animals. Growing importance of including proteins in livestock diets to ensure energy supply in balanced diet to reduce harmful impact of environmental and heat stress on animals which is likely to drive animal feed protein ingredients market size. Moreover, key players are adopting technologies to formulate protein products with regulatory compliance along with cost effectiveness.